All about the items we distribute through our company. 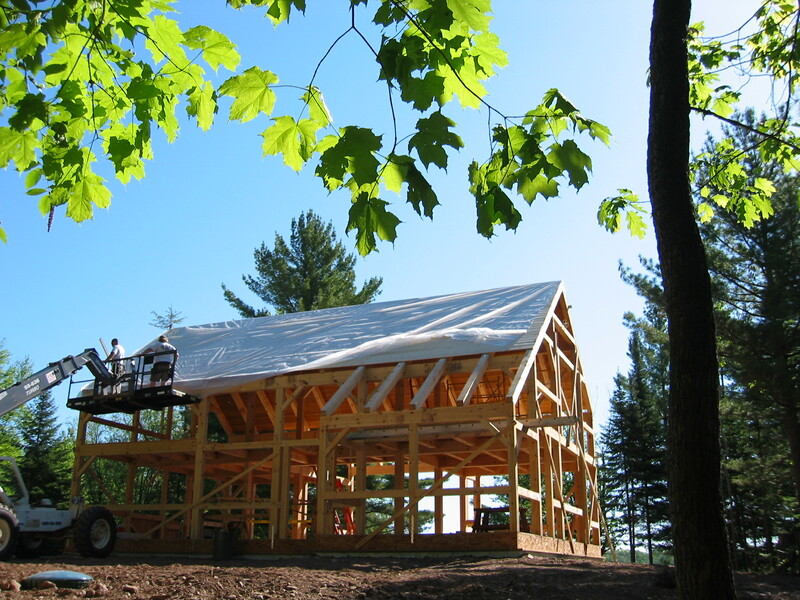 Our first experience with using foam on the exterior of a structure, besides using it to insulate our poured concrete foundations, was during 2005, when we built our first Timberpeg, Post & Beam home. We had the choice of implementing one of two different methods. The first method is what’s referred to as “wrap and strap”. This method relies on the use of multiple layers of 4’x8′ foil-faced, isocyanurate foam panels, 4’x8′ sheets of plywood and 1×4 pine strapping. This method provides an excellent thermal boundary, while leaving the beauty of the timber-frame joinery fully exposed at the interior of the home. 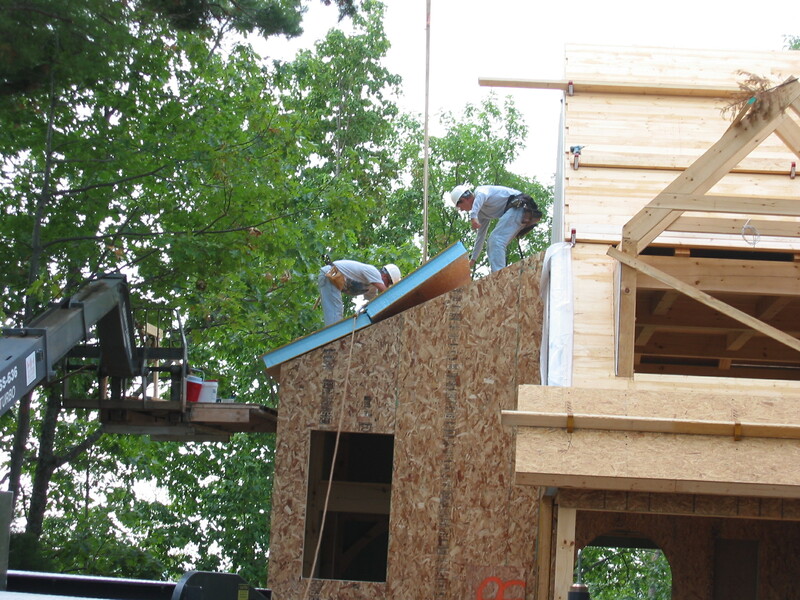 The “wrap and strap” method helps to hold down materials costs, but due to the fact that it requires multiple trips around the structure, in order to install each layer, it requires more labor than the second method of using SIP panels to enclose the frame. We choose the “wrap and strap” method, because of the material cost savings, but after taking those multiple “trips” around the house, we vowed to try the SIP option on our next Timberpeg post & beam project and we did just that. Our experience has shown that the SIP panels speed the process and provide higher levels of air-tightness and strength. 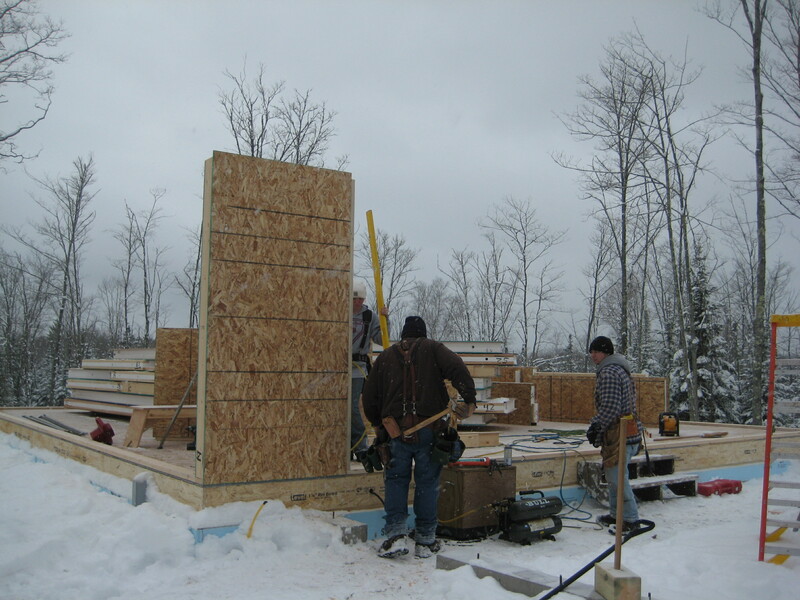 It was obvious to us that SIP panels were the perfect way to create a strong, air-tight, robust thermal boundary for our Timberpeg projects, but we realized that some of our clients might not be interested in a timber frames structure to go along with the SIP’s. We immediately became interested it bringing this building envelope system to our all of our clients. 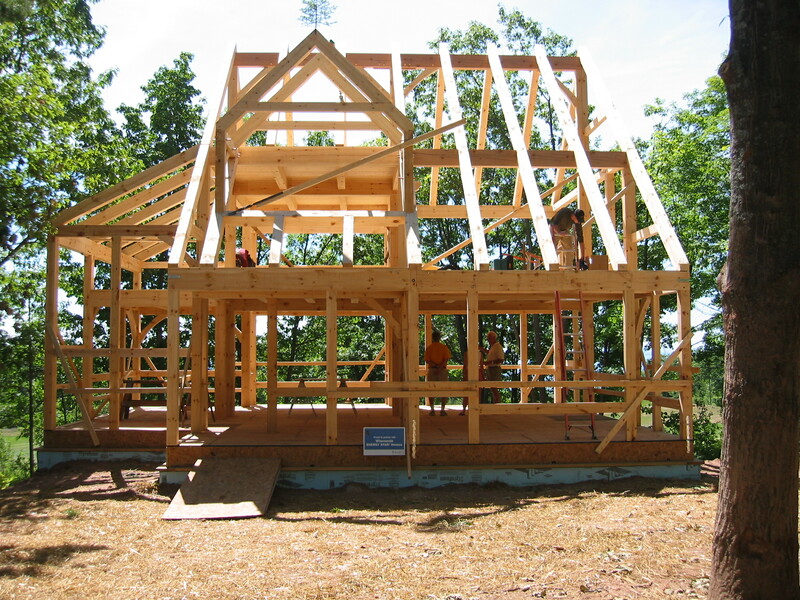 Folks that might not be interested in a beautiful post & beam frame, but wanted a home that was safe, durable and energy-efficient. We did our homework and researched the different SIP panel companies. We were looking for a company that had the best system, had a great reputation for customer satisfaction and wasn’t too far from our home range. We found Enercept to be the best of the SIP panel companies. Their commitment to quality and service is second to none. It is a real pleasure to work with people who share our values and our commitment to helping people save energy and our environment. At that time Enercept had been in business for over 25 years and had a great track record. In our previous post, we talked about the challenges we face in educating consumers and SIP’s fall under the category of the unknowns. SIP panels were invented at the Forest Products Laboratory (FPL) in the mid 1930’s. Some of the earliest examples of SIP construction can be found in the Usonian homes, designed by visionary architect and early adopter, Frank Lloyd Wright. It was one of Wright’s student’s, Alden B. Dow, son of Dow Chemical founder, that was the first to use foam between the panel skins. That was in 1951. Now, you know. SIP’s have been around for quite a while, but public awareness of this killer-app building envelope technology has gone almost unheard of… Until now. Think about that last scolding hot coffee or chocolate that came in a styrofoam cup. You had 1/8 of an inch of foam, between your hand and the hot liquid. Now, think about a wall system with 5-1/2″ or 7-1/2″ of foam in your walls and 9-1/2″ or 12″ of foam in your roof system. Are you catching on? SIP homes are very energy-efficient. They are also very air-tight. Did I mention quiet? SIP homes are also very quiet. The sound deadening properties of SIP panels are excellent. Another benefit of building with SIP’s is the construction time line. We’re able to get projects under-roof in record time. The last two SIP homes that we built were in the 1800 square foot range and each was under-roof within 4 days. SIP homes are also very strong, due to the nature of the construction of a SIP panel and the shear strength inherent with its design. SIP homes are 2-1/2 times stronger than typically built homes. There are many reports of SIP homes surviving earth quakes and tornadoes, worldwide. As you can see, there are huge benefits to building with SIP’s. We at Great Lakes Carpentry believe that using SIP panels for our building envelopes makes perfect. We consider them to be the wave of the future. The small amount of extra costs to build using SIP’s is recovered very early on, after which our clients realize very meaningful savings on the costs to operate their homes, for the life of the home. One would think that cutting edge home building technology like this would be part of the conversation, when considering a new home. This is not the case. We continue to encounter folks that don’t have a clue about this great way to build. Our biggest hurdle lies in educating the customer. In most cases, once we show our prospects this system, they have a eureka moment. They get it! Because it’s so obvious. Who wouldn’t want to save 40% to 60% on their energy costs? We refer to our most recent SIP home as “The Energy Sipper”, because of the fact that is sparingly “SIP’s” energy. We used Alpen High Performance windows, as they are the perfect fit for this type of building envelope. We are very proud of the fact that we achieved stellar performance levels for the home. We achieved Passive House air-tightness standards, which are the most stringent energy design criteria in the building industry and we achieved a HERS score (home energy rating system) of 37. The HERS rating is fast becoming the industry standard for calculating the efficiency of new homes. Similar to miles per gallon. We strive to reach the lowest number possible. Net-zero energy homes are on the horizon and we’re anxious to get the opportunity to build our first in the near future. 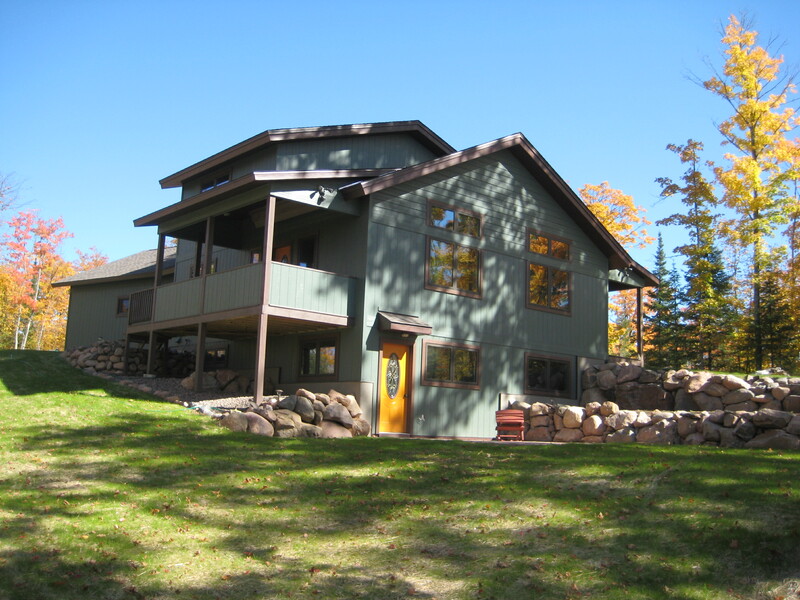 Great Lakes Carpentry specializes in building what we refer to as “Future Proof” homes. SIP’s are a big part of our strategy. As always, our goal is to help educate the public about the benefits to building energy-efficient new homes and remodeling projects. If you find this post educational and you believe in building homes that are part of the solution and not the problem, forward this post to a fiend. Together, we can help drive the paradigm shift to building responsibly. We love to talk about energy efficiency and building science. If you have any questions or are interested in building a future-proof home, contact us today. 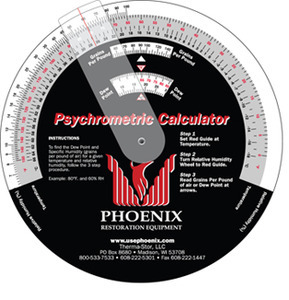 Psychrometrics is a term that most homeowners have never heard of. It’s sad to say, but most builders aren’t familiar with this term either. Although the principles of psychrometry apply to any physical system consisting a gas-vapor mixtures, the most common system of interest is the mixture of water vapor and air, because of its application in heating, ventilating, air-conditioning and meteorology. In human terms, our comfort is in large part a consequence of not just the temperature of the surrounding air, but (because we cool ourselves via perspiration) the extent to which that air is saturated with water vapor. What we’re really trying to do here is to determine where the dew point is, in relation to the indoor environment of our homes. The dew point is the temperature below which the water vapor in a volume of humid air at a given constant barometric pressure will condense into liquid water at the same rate at which it evaporates. Condensed water is called dew when it forms on a solid surface. With the advent of more sophisticated envelope designs for houses, it has become increasingly important for residential designers and builders to understand psychrometrics – the behavior of moist air under various temperature and humidity conditions. One basic tool is the “psychrometric chart”. Most people get dizzy just looking at a complete chart and to master its use is a challenge even for many engineers. Our understanding of Building Science tells us that it’s critical that we understand the impact of the design decisions that are made and how they will affect the performance of a variety of building components in the home. 1- During winter, will condensation occur on ventilation intake ducts located in a heated basement? 2- Under what conditions will condensation occur on cold water pipes? 3- If a wall is insulated with R-19 fiberglass plus R-7 exterior foil-faced foam sheathing, will condensation occur on the inner foil face of the sheathing? 4- Why am I having window condensation issues? We know that over 90% of building material failures are caused by water. If it isn’t a leak in the building envelope caused by lack of proper flashing details or poor workmanship on roofing or siding, it’s damage caused by condensation. Condensation can really take its toll on a structure, because a good deal of it takes place in areas that are hard to access. It happens at your rim-joist, your roof system and in the cavities of your framed wall that rely on fiberglass insulation. In addition to the structural damage caused by unchecked condensation, these areas can become a breeding ground for mold growth, which can lead to poor indoor-air quality. Countless numbers of wood windows have been destroyed by condensation issues. Knowing how to deal with existing issues and how to avoid them during the design phase for our new homes is crucial. 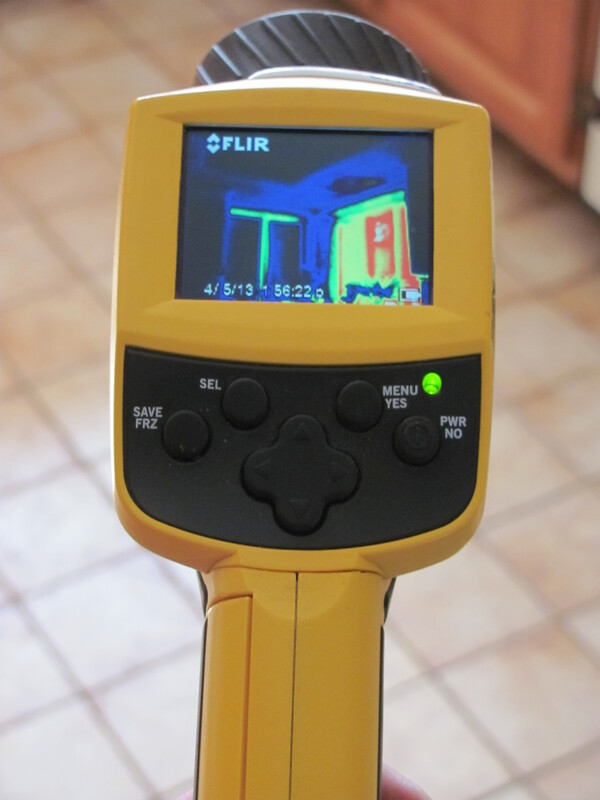 We use our understanding of Building Science and specialty tools like the infrared thermometer above, to help us gather the information we need to make a determination, so we can help owners of existing homes to develop strategies that will reduce the likelihood of condensation forming in rim joist bays, wall cavities, roof systems and windows. 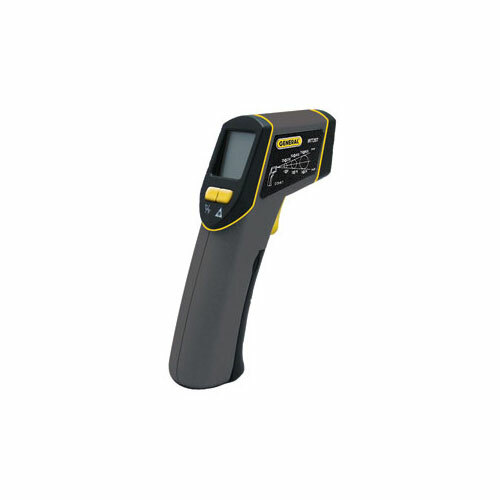 The infrared thermometer will provide us with the current temperature reading of any given surface, but we need to take all things into consideration, in order to make use of our psychrometric calculator to determine where the dew point lies. We need to take the indoor air temperature and the relative humidity of the home into consideration, if we are to determine where the dew point lies. 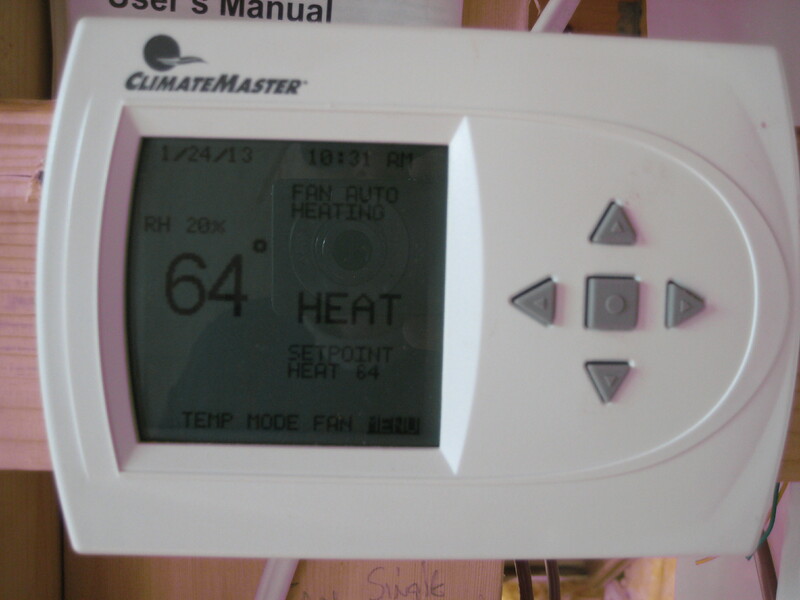 The thermostat below is an example of one that has the capacity to measure the relative humidity. The image below is of thermometer/hygrometer device, which provides current readings on temperature and relative humidity. We’ve heard it said that, “knowledge is power” and this holds true in this instance. This is more than a moisture issue. 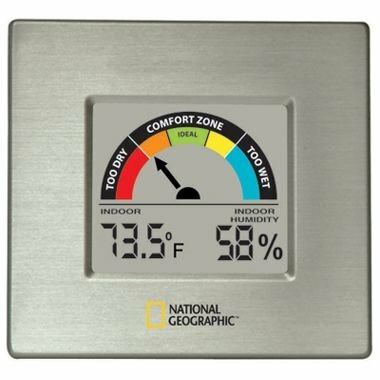 The relative humidity of your home has an impact on your level of comfort as well. There is a “sweet spot” where all of these driving forces converge. This “sweet spot” is a moving target as outdoor and indoor conditions are constantly changing. Understanding how these laws of nature come into play in your home gives us the ability to work through the problems we see in existing homes and the information we need to avoid these issues in the new homes that we build. 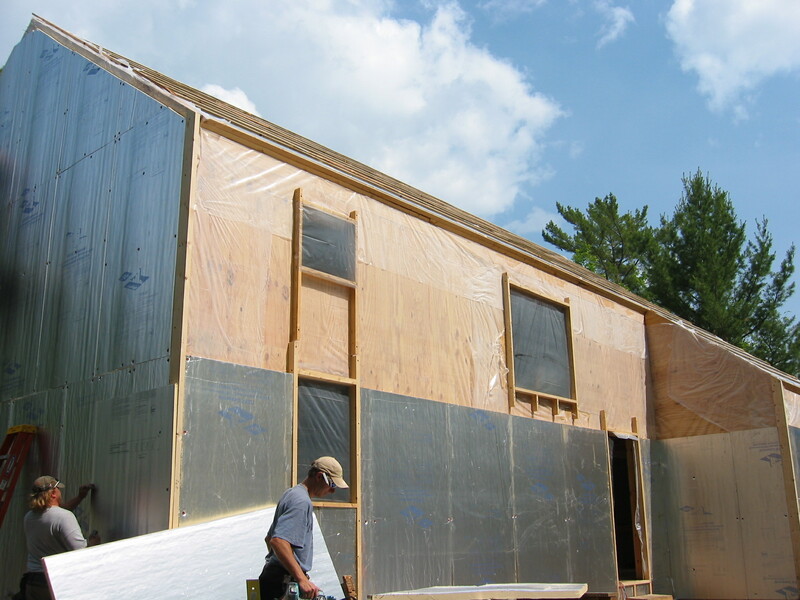 By specifying high-performance, super-insulated building envelope systems and super-insulated windows, we’re able to build out the inherent problems that most builders build in to their homes. By doing so, we’re able to provide our clients with homes that are comfortable, safe, healthy, durable and energy-efficient. If these are attributes that you find appealing, contact us. We love talking about building science, high-performance home building and how we can save you 40%-60% and more on your heating and cooling costs. In our last post, we talked about using the Duct Blaster, for testing the duct work in our high-performance homes. In this post, we’ll focus on the importance of providing proper mechanical ventilation in all homes and how we use “Tools of the Trade” to test the performance of ventilation systems in the new homes we build and in our remodeling work. The Balometer is one of the “Tools of the Trade” that we use to test the performance of the mechanical ventilation equipment that we install in our high-performance homes. Balometer® instrument directly reads average air flow rate, either intake or outflow, at ceiling, wall or floor diffusers. In use, air to be measured is directed past a manifold which senses flow at multiple points spread across a carefully sized area. 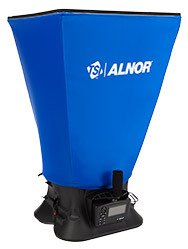 The manifold is designed so that the air volume is sensed at either supply or return diffusers with equal accuracy. In our quest to build increasingly tighter homes, we came to realize how critical it is that we take an active role in managing moisture vapor in our homes. Heat recovery ventilators (HRV), bath fans and range hoods are key components used to help manage indoor-air quality by expelling moist, stale air. Through our study of building science, we’ve come to realize that in the cold climate where we build, a one inch hole in the building envelope will attract 30 quarts of moisture during the course of one heating season. When I first heard of this phenomena, I was shocked and thought that this couldn’t be true, but when you consider the fact that each occupant contributes 4 pints of moisture, per day, through breathing and perspiration, you start to get a clue. When you take into account the moisture that your pets, plants and non-vented combustion appliances add to the equation, you get a sense of how this can have an impact. Now, consider the additional 4 pints of moisture that each occupant contributes each day, by cooking and bathing and you can see how it’s easy to reach the 30 quart mark for a heating season. Simply installing properly sized mechanical ventilation equipment isn’t good enough. We use the Balometer to test and verify the performance of each system installed. We’ve seen far too many bath fans, in particular, that did not perform as specified. The builder may not have understood how to calculate the drop in flow rate that some ducting options contribute to. The distance from the fan and where exhaust exits the structure might not have been taken into consideration. The installer might have missed the fact that there was a screw holding the damper shut for shipping purposes and neglected to remove it. The duct work could have too many turns or was crushed during the course of insulation work being performed. There are many factors that contribute to the performance of mechanical exhaust equipment. At Great Lakes Carpentry, we don’t simply install any type of mechanical ventilation equipment and walk away. We take mechanical exhaust ventilation into consideration during the design phase. We plan our path and calculate distance to where exhaust will terminate. We consider size of room, length and configuration of duct run and duct material and size, in order to properly size the exhaust equipment. With so many ways for an installation to go wrong, testing is crucial. By using “Tools of the Trade” to verify that all mechanical exhaust ventilation is properly installed and functioning as it should, we provide our clients with added value and peace of mind in knowing that everything is operating and functioning as it should. The final link in the chain is perhaps the weakest. Too often, we’ve heard of complaints from homeowners about moisture problems in the bathroom and have come to find that the occupants aren’t turning the fans on when they enter the bathroom.We’ve worked to resolve this problem by providing our client’s with a homeowners operating manual. We educate our clients on the necessity of using exhaust ventilation and in some instances we’ll install a delayed timer switch or linked the fan with the light switch, so it comes on by default when the light is switched on. State building codes are legal minimums. Performance standards are mediocre and there is no testing required. Great Lakes Carpentry is building next generation, homes for the future, now. Now that you have a choice, the question becomes; Do you want your home to be built to minimums, with no accountability from your builder and no clue as to how efficient your building envelope, combustion appliances and ventilation equipment performs, or would you prefer to build to higher standards of performance and accountability? The choice is yours. If you’d like to learn more about home performance testing, exhaust ventilation, high-performance home building or building science, contact us. We love to talk about this stuff! Please stay tuned for our next post, where we’ll talk about the Psychometric Calculator, how we use it to determine the dew point and how that relates to you and your home. Our previous post focused on the infrared thermal imaging scanner that we use to detect air infiltration into new and existing homes. In this post we’ll focus on another of the diagnostic tools of the trade that we use to verify supply and return-air efficiencies in forced-air heating/cooling systems. 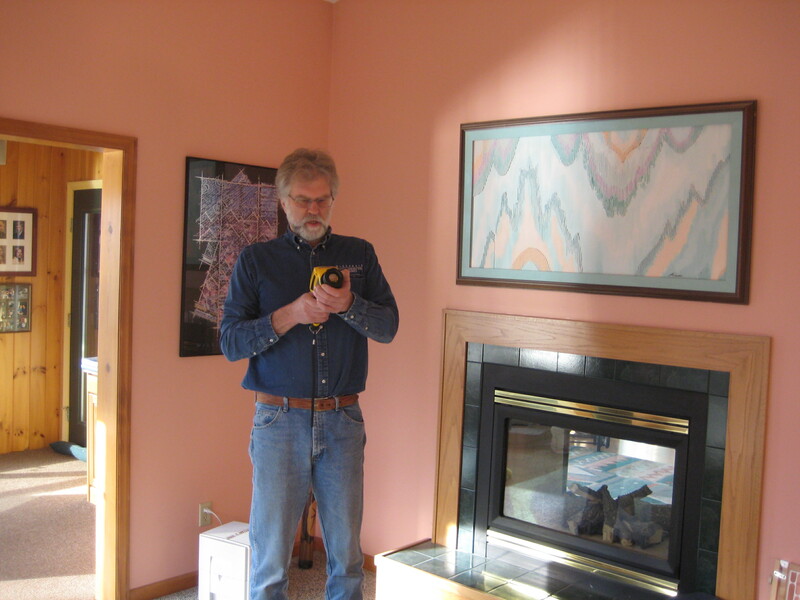 We use the Minneapolis Duct Blaster to perform a “Total Leakage Test” of the duct system. 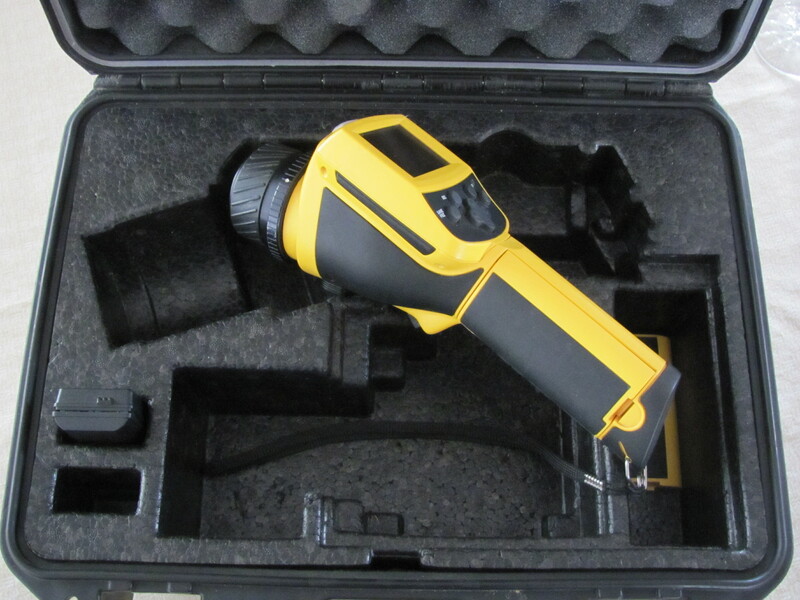 The Duct Blaster is a device that uses pressure testing to find the amount and location of air leakage in a duct system. To do the test, we seal all outlets except for one on the return side of the system. This is the side that returns stale air to the furnace to be reconditioned. 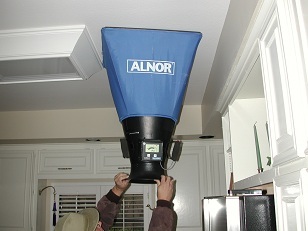 The Duct Blaster is connected to this return-air opening and then turned on to blow air into the ducts. The air goes through the return ducts to the air handler and then through the supply ducts. If the duct system is very tight, it doesn’t take much airflow through the fan to pressurize the ducts. If you have a big leak, like a disconnected plenum or duct, it will be next to impossible to pressurize the ducts adequately. This would be like trying to pump air into a tire that has a big hole in it. The process yields quantitative results because testing requires two pressure measurements: one inside the ducts and the other inside the fan. The first allows the tester to compare results from different systems by always pressurizing to the same level. The second measures the airflow in the fan when that level is reached. As mentioned above, tight ducts means low airflow, and leaky ducts require lots of airflow. Pressurizing only the ducts determines the total leakage. That includes the air that escapes into the conditioned space and the air that leaks to the outside of the building envelope (i.e., the attic or crawl space). The latter is the most important part because you derive no benefit from it. To separate it from the total leakage, we pressurize the house to the same level as the ducts by using the Blower Door. Then, when the Duct Blaster brings the ducts up to the required pressure, none will leak to the inside of the house because it’s at the same pressure as the ducts. The fan only has to blow enough air in to make up for the leakage to the outside, and that’s the amount that’s important. In a tight air distribution system, the leakage to the outside (in cubic feet per minute, or cfm) will be 5% or less of the square footage of the home. Most new installations start at about 15% to 20%, and go downhill from there. 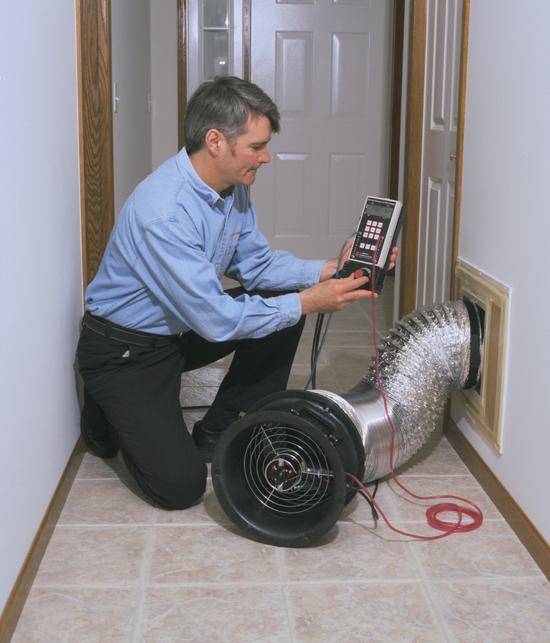 At those rates, a third of the heating and cooling bills could be a direct result of duct leakage. After performing a Duct Blaster test to determine the amount and locations of air and duct leakage, we seal up the leaks that we find. Upon completion the house and/or duct system will perform better, and your heating and cooing bill will be lower. You can follow this link to a you tube video part 1 of 4 videos. 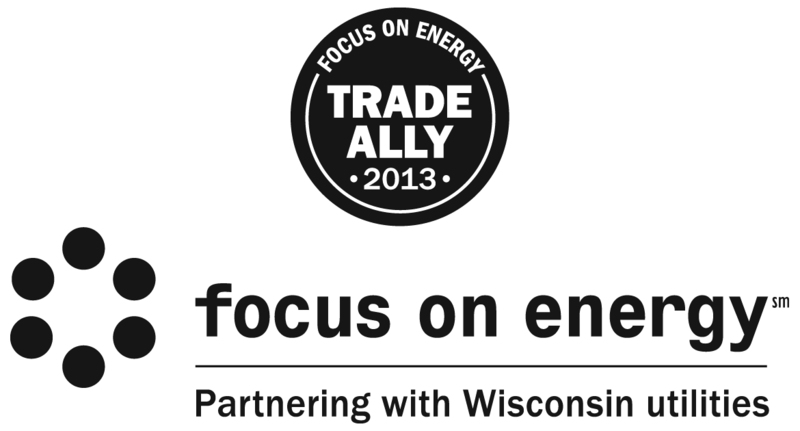 As they say at Focus on Energy, “Testing Trumps Talk” and we couldn’t agree more. By testing and verifying the tightness of the building envelope and the duct systems in our high-performance homes, we are able to identify any deficiencies and take corrective measures. Lower operating costs, greater comfort, safety, durability and higher resale values are just a few of the benefits realized by implementing building science principles and best practices into the homes that we build. By testing, inspecting, and documenting the quality of work, we bring a higher level of added value and peace of mind for our clients. The Duct Blaster is another diagnostic tool of the trade that helps us in delivering the added value that is built-in to our high-performance homes and remodel projects. If you’d like to learn more about how we can provide added value to your new home or remodel, please visit our website and contact us. In our next post, we’ll talk about mechanical ventilation, exhaust equipment and the diagnostic tools of the trade that we use to verify performance and efficiency of this critical component of the high-performance homes we build. 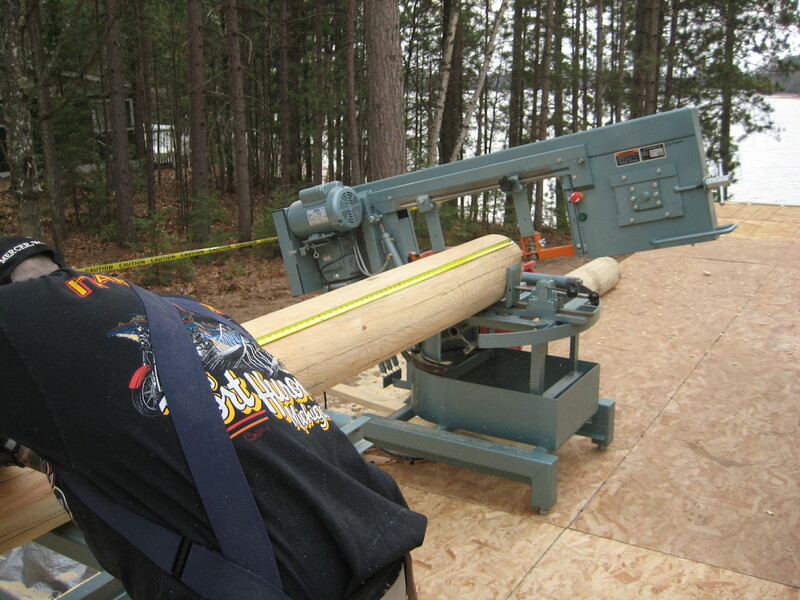 Here, in the lakes region of Northern Wisconsin we rely on many tools during the course of building the beautiful, energy-efficient homes that we build. In our quest to build responsibly, we rely heavily on a second set of specialty “Tools of the Trade” and we consider these to be the tools that help us to bring the greatest amount of added value to the homes that we build. We consider the knowledge and specialty tools that our Home Performance Professional brings as very special and critical “Tool of the Trade” in our high-performance home building tool set. We consider this professional and what he brings as one of the most valuable tools brought to the process. We like to bring him in early on during the design phase as a second set of eyes and as an adviser in planning and executing our most efficient and cost-effective, energy-saving strategies. Once we have specifications called-out he uses licensed computer software to run an energy model that will help to predict the energy consumption of the home, based on design criteria. This helps us to set efficiency and performance goals and in working together, along with the homeowner in the decision-making process, to achieve these goals. Next to our H-P Professional’s skill sets, the “Blower Door” and its’ peripherals are probably the most important tool in the set. 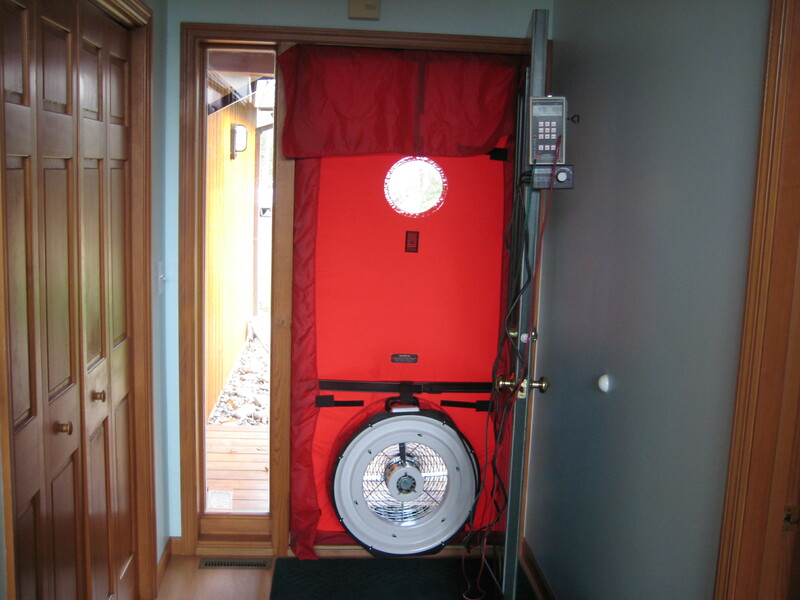 The blower door is used to depressurized the home to 50 pascal, which is the prescribed level of depressurization for measuring air-tightness in a home. The fan is mounted in the bottom of the canvas face-frame that seals the entry door opening. All windows and any other doors in the home are closed and locked. The blower door is connected to a pressure & flow gauge that senses outside and inside air pressures and communicates with the blower door and a laptop computer that runs sophisticated software. Once everything is connect and we’ve checked that there will be no conflicts with combustion appliances or any safety issues, we begin the test. The blower door fan ramps up to the precise speed that it needs to be at, in order to depressurize the home to 50 pascal via communication with the pressure gauge and software. This simulates a 20 mph wind coming at the home from all directions at once. 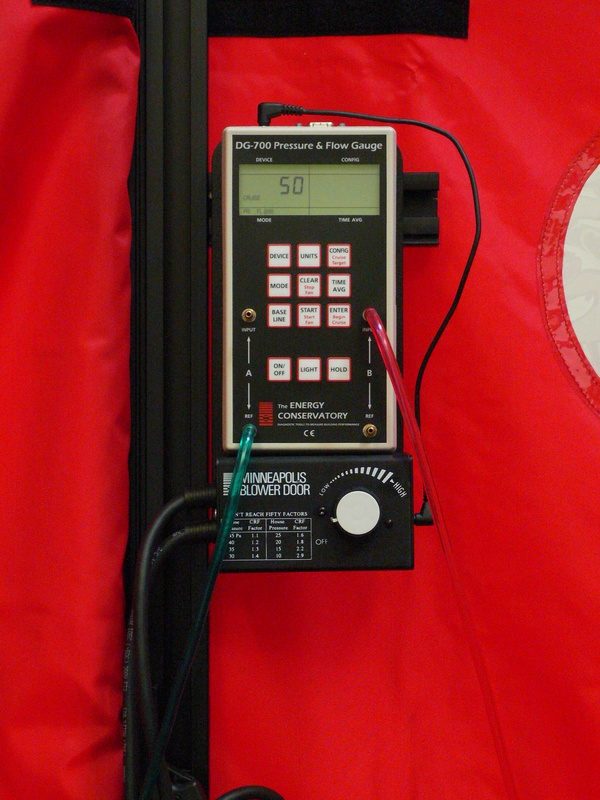 The pressure and flow gauge is communicating with the fan and the computer software which gives us the information we need to estimate the air-leakage rate of the home and how many air changes per hour we have during depressurization at 50 pascal and what we can expect under normal operating conditions for the home. Now that we have a 20 mph wind coming at the house from all directions it’s the perfect time to visually check for areas of air-leakage. The low-tech way to do this is with a smoke stick. This can be used around window and door openings to detect air leaks. It can also be used at roof to wall connections and anywhere where one might suspect air leakage. This is old school method of detecting air leaks, but still has its place in the tool box. There is a much more high-tech method for visually detecting air-leakage and we’ll cover this and some of the other “Tools of the Trade” for building high-performance homes in our next blog post.